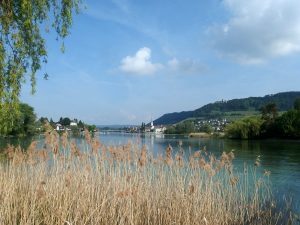 Maybe it was the schnitzel with noodles for dinner on the first evening, but my recent holiday cycling round Lake Constance had a definite Sound of Music to it. Same glorious mountain views and picture-perfect villages. Constant Favourite Things ear worms. But a whole lot more water and zero nuns. As well as providing endless photo opportunities, the 5-day tour gave me some interesting insights into being European, borders and how they do things in central Europe. 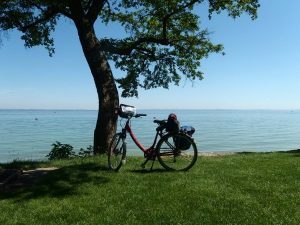 This isn’t a piece about cycling round Lake Constance itself – lots of travel blogs already deal with that – but more my observations on our way round Europe’s largest freshwater lake. Central Europeans love keeping time. You’re never far from a striking clock. Even in the smallest village you can keep track of the passing of every quarter of an hour. The only cuckoos we heard, however, were real ones and keeping their own time. Central Europeans do lakeside beaches very well. 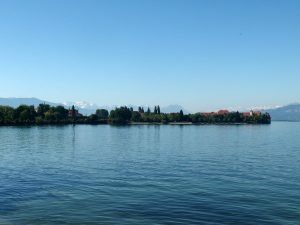 They might not have the sand or real waves, but the recreational areas next to Lake Constance have great facilities and are squeaky clean. It’s tidy. Maybe it’s all the time keeping but everything’s very ordered and you won’t see a scrap of litter. The Germans are wedded to their caravans. And for the Swiss, a park home is an absolute must. Garden gnomes pop up (literally) everywhere and not just in gardens. Skimpy Speedos remain right on trend for the older man in both Germany and Switzerland. I’ve lived in Europe all my life and consider myself European. But it wasn’t until this holiday that I got a real sense of being at the heart of the continent. Malaga and the Costa del Sol, my home for the last 30 years, always feel a little out on a limb, on the periphery of Europe with just Portugal for company. 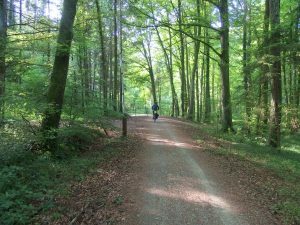 Cycling round Lake Constance, on the other hand, we zigzagged through the heart of Europe. I don’t know the exact geography but Lake Constance must be pretty near the epi-centre of Europe. 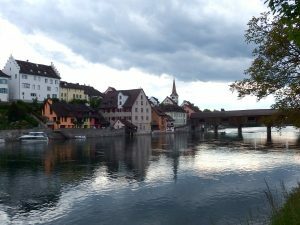 It certainly felt like it as we popped in and out of Switzerland, Germany and Austria. France and Italy were both just a short distance away. We travelled 277km on our bikes through 3 countries and every day we visited at least 2. We lost track of the borders we crossed – it was often hard to tell if we’d actually entered a different country. We might see the occasional flag or discover the coffee was €8 instead of €4. But it didn’t matter because nothing really changed. And no one asked to see our passports. The Rhine or bridges often made up the natural frontiers and we saw no manmade barriers except for one in the middle of a very dense beech wood. There was something poignant about 2 rusty (raised) barriers flanked by a red and white pole for Switzerland and a black, yellow and red one for Germany. When was the last time this barrier was down? With the refugee crisis still unresolved despite its urgency on the European agenda, the lack of borders we encountered seemed almost an insult. 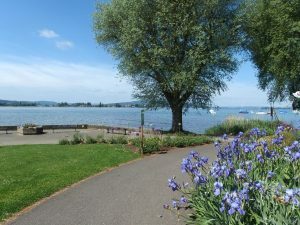 The cycle ride round Lake Constance is certainly very white and very western European. The only obvious immigrants we came across was a group of Romanians cleaning the public toilets in Bregenz. The sheer joy of miles (and miles) of cycle lanes through miles (and miles) of woodland, fields and valleys. The lake at every turn (and that’s every). The Pfanderbahn Cable Car – the hills really are alive at the top of that one. The painted façades and oriel windows in most of the towns and villages. 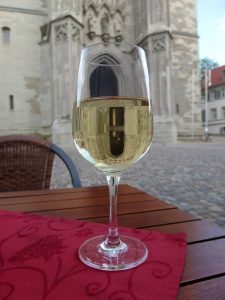 The craft beer and Bodensee white wine and Prosecco. Kaffee und kuchen. The Germans and Austrians do both so very well. Pay for the best bikes you can afford. Comfort in the saddle, good suspension and a range of gears are all musts. Don’t worry about the miles. I will admit to feeling a little daunted by the 70km ahead of us on day 1, but if you’re reasonably fit the distance just slips by. Stretch long and often. Follow the signs religiously even if they seem to point you in the wrong direction. They know best. Swot up on some German before you go. A surprising number of people don’t speak anything other than German. Menu cards in English are rare. Go out of season. Our trip at the end of May was perfect timing and most of the time, we had the route pretty much to ourselves. Except for one day that coincided with a public holiday in Germany and Switzerland, and gave us a taste of what the cycle lanes must be like in high season. And finally, put it on your must-visit list. There’s something very special about all that water and those snowy Alps behind it. This trip has definitely gone down on my list of Favourite Things.